1 – How do we help people maintain good work-life balance? Have a 4-day working week? 2 – How to avoid using things such as yoga/mindfulness as a sticking plaster for poor culture that is damaging/overworking people? 3 – How can leaders role-model good behaviour/lead by example? 4 – How do we support freelancers/those working alone/remotely (who could slip through the net of any programmes supporting mental health). 6 – Do HR departments actually exacerbate the experiences of people suffering mental health challenges in the workplace through poor practice? 7 – How can flexible working help? 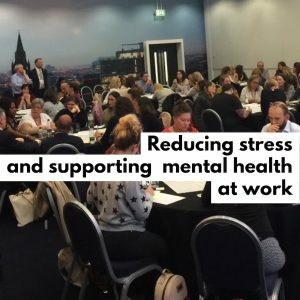 8 – How can we destigmatise poor mental health in the workplace? 9 – What practical things can wellbeing champions do? Nicky Ingham: It is important to be honest and true to yourself when going through challenging times, it can happen to anyone at any level. It is okay not to be okay and the more we talk openly about mental health and wellbeing in our profession, the more it will become part of day to day life without fear of reprisal or stigma. Workforce leaders have a unique position acting as the organisations conscience and we should take our rightful place at centre stage supporting organisations to shape a culture that embraces wellbeing as part of its DNA rather than the next ‘fad’, transparency engages the workforce to give of their best in an organisation that encourages openness and honesty in all that it does.